This study looks at how human agency opens up opportunities in unlikely places and counter intuitively results in "unintended consequences of contributing to the formation of sustainable institutions." Using the example of the game of Tennis as an illustration, this study makes the claim that there exists a type of entrepreneurship called "Conversion Entrepreneurship" that specialises in developing bridging transactions between spheres of exchange. In tracing the micro level entrepreneurial processes involved in Flea Market trading at Avondale in Harare, this study unveils how trader-entrepreneurs progressively develop specializations and institutionally protect their interests while still engaged in near to perfect competition amongst themselves. 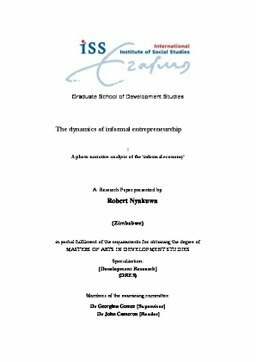 This study argues that a ‘flea market‘ in the Zimbabwean context represents a ‘liberal/ free space‘ that incubates entrepreneurial skills. By using a ‘zone of transition model‘ this study highlights the limits to bottom up processes of economic agency without complementary institutions.